On the Lower Acropolis, a house of the Hellenistic period was excavated. The house, which is of the prostas type, has four rooms in the eastern part and a courtyard to the west (fig. 1). The whole house complex covers almost 150 sq. m. A hearth with an associated ash layer and a small square structure were found in the north-western of the four rooms (fig. 2). The hearth has a rectangular shape and is framed by long and low stone blocks. The square structure is built up of four courses of irregular stones with a large Corinthian pan tile on top. A couple of cooking ware vessels were found in situ next to the structure, which should most likely be interpreted as a so-called cooking installation. In the north-eastern room of the house, a debris layer representing the collapse of the roof structure was identified. The collapsed roof had caused many of the objects originally stored in the room to be preserved in their original context. Among the ceramic finds are a krater, a larger jug, a lamp, a larger deep lekanis and a terracotta grill. The presence of hundreds of fragments of stucco in white, red, blue and yellow colours shows that the room had painted decoration on the walls, which was probably the only room in the house with decorated walls. In the north-western corner of the courtyard a round-structure with larger terracotta plaques placed on top of it was found (fig. 3). The structure has a diameter of ca. 2.6m and is built up of up to six courses of stones. The date and function of the structure remains unclear, but it might have been a courtyard granary. Two partly superimposed ovens were found next to the round-structure in the courtyard. The ovens are constructed of clay and their interiors show discoloration from fire. An almost completely preserved transport amphora was found overlaying one of the ovens. At the time of the collapse of the kilns, the amphora was most like standing up against the kiln. Two streets that run parallel to each other to the south-west and north-east frame the whole house complex. The preliminary study of the material retrieved from foundation fill of the road and other contexts suggests a construction date for the house in the early Hellenistic period. Based on the date of the ceramics found in the room with the collapsed roof and the amphora found at the ovens, the house seems to have suffered destruction and abandonment around the middle of the 2nd century BC. Nevertheless, it is clear from the substantial amount of Roman terra sigillata pottery found that the was some form of activity around the house in the late Republican or Augustan period as well. In 2014-2015, two trenches were also excavated at the fortification wall that surrounds the Acropolis (fig. 4). The excavations showed that the wall was constructed as a ca. 3.5-m-thick double-faced wall with a rubble fill consisting of smaller stones and soil. The exterior wall is more substantial than the interior and was constructed in a pseudo-isodomic style of which six courses preserved. The latest datable ceramic finds from the fill layer dates to the late Archaic/early Classical period, and it is likely that construction of the fortification should be dated to the early Classical period. Behind the interior wall a large fill layer was identified. The layer was probably dumped there to level the area behind the fortification wall. Many ceramic fragments dating to the late Geometric and Archaic periods were retrieved from this fill layer, which most likely represent the debris of earlier phases of occupation on the Acropolis hill. Unpublished field report by Olympia Vikatou and Søren Handberg; see also: Vikatou, O. & S. Handberg 2017. The Lower Acropolis of Kalydon in Aitolia: preliminary report on the excavations carried out in 2013-15. 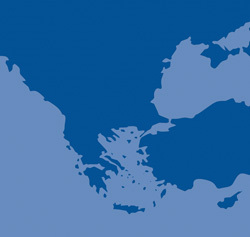 Proceedings of the Danish Institute at Athens 8. Fig. 1/ Schematic plan of the Hellenistic house and the excavated part of the Acropolis fortifications. Fig. 2/ The room with the hearth and the cooking installation. Fig. 3/ The courtyard of the Hellenistic house. Fig. 4/ The Acropolis fortification wall, with rubble fill of the wall clearly visible in the eastern profile of the trench.